If you’re going back to work soon from maternity leave (or have recently re-entered the workforce) and are planning to continue breastfeeding, you’re going to face a bit of an adjustment period. Today I’m tackling one of the most challenging aspects of breastfeeding for many working women. This post provides actionable tips to help you reach your breastfeeding goals – even if you’re away from baby at work. Although there are multiple issues that you may face when working outside the home, a huge concern most moms have is around maintaining supply. Making the shift from full-time nursing to pumping can seem daunting. Is It Really Possible to Breastfeed While Working? Fear not, although it may seem impossible at first – you can continue breastfeeding for as long as you want. Even with a full time job. If I can do it, you can do it. I’m not going to promise that it will be easy all the time, but it’s absolutely achievable. 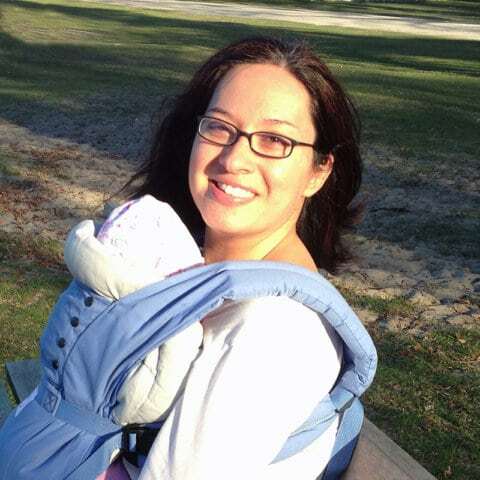 I breastfed my daughter for 19 months, and pumped at work until she was a year old. I pumped EVERY. THREE. HOURS. For nine months. I was incredibly lucky as little lady was just across the street at daycare. I was able to go and nurse her at lunch most days, which is one of the reasons we made it the full year without supplementing. I’m no one special, and I didn’t have 50 ounces of breastmilk every day. It took hard work, determination, and commitment. If you’re interested, you can also check my breastfeeding survival guide! Ok, I’m On Board. How Can We Do This? Build up a stockpile of breastmilk while you’re on maternity leave and freeze it for later. I was SO paranoid that I’d have to travel for work and I would starve the baby or need to supplement. I needed a large stash to make myself feel comfortable going back to work. I pumped every day for the first three months while I was on leave. If we fed her a bottle, I pumped again to replace that feeding. I NEVER fed the baby a bottle of milk without pumping to replace the milk we were using. I used these storage bags since they were the cheapest, and I didn’t have many leaks. Out of hundreds of bags, I only had 3-4 with issues. I froze the milk flat and put it in gift bags as they were the perfect size for storage. I ended up getting a 5 cubic foot deep freezer once we filled up the bottom of our normal freezer. I wanted to be able to eat frozen food again! In the beginning, when I was pumping after long stretches of sleep at night, I’d get 6-8 oz. of milk after the morning feeding. During the later months, I only got 2-4 oz. during my morning pump. Those extra ounces were always what got us through the day. I never quite made enough pumping during the day to fill her bottles. The morning pump is what kept me from depleting my stash early on. Once you get back in the office, don’t skip pumps. It is a slippery slope. Once you “allow” yourself to miss a session, it becomes really hard to reinforce the strict schedule. If someone booked over one of my pump sessions I’d ask to move the meeting. If a meeting was running late and I was going to lose a pump session, I’d politely step out. Make feeding your baby the priority. This not only helps build up your freezer stash but also helps boost your supply. It will inevitably lower once you’re no longer nursing all the time so this is a great way to stay on track. Once I went back to work I always felt like I was using more milk than I was pumping. This stressed me out less because I had that great stash from maternity leave. I also still pumped on the weekends to make up any milk I “overdrew” during the week. We went about 9-10 months without really digging into the freezer stash. I didn’t really start seeing a decline in our frozen ounces until 11 months. At that point, my supply dropped pretty significantly. I also wasn’t as diligent about going to feed her at lunch, or pumping three times every single day. I don’t know if lactation cookies worked in reality or only in my head, but I made myself these lactation cookies every time I was feeling really down about my supply. They always helped! There is a very real possibility that this was a placebo effect because I didn’t include the brewer’s yeast or actual galactagogue ingredients, but hey, whatever works. I did also try Mother’s Milk tea. It tasted gross and I didn’t believe it would help me so I only had two cups. I mentioned this before, but I think we made it because I was going to daycare to nurse at lunch as often as possible. I also never gave the baby a bottle when I was there and available to nurse. I truly believe that not having to pump out three full bottles a day is what kept me from supplementing. When I pumped three times at work (instead of going to nurse at lunch) I never got the amount she was drinking from the bottle. She always seemed satisfied when we nursed, so I went almost every day until she turned 11 months, then once or twice a week until she turned one. I also did a dream feed* before I went to bed each night. I have no idea if this helped with getting her to sleep longer. Since she ate, I know it was helping with my milk production. I also nursed every time she woke up to eat during the night. 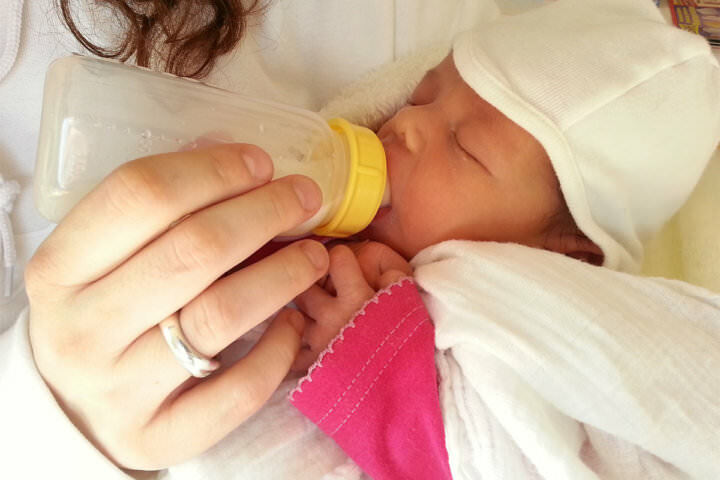 Although hubby occasionally went in with a bottle, more often than not I was handling the night feedings. Which lead to a lot of lost sleep. Although these tips won’t work for everyone, they helped me make it beyond a year breastfeeding even when it seemed like an impossible goal. Building a stash early, adding in additional pumps, not skipping sessions while at work, and nursing as much as possible allowed us to make it the entire first year exclusively breastfeeding. If I can do it, so can you! *A dream feed is a feeding you give to the baby after they go to sleep but before you go to bed. It’s done in hopes of getting a longer first stretch of sleep for baby, which gives mamma a little more uninterrupted shut-eye. Hi, I’m Carly! I’m a working mom of a toddler trying to get things done and stay caught up as life rushes by. I have a full-time job and feel like I spend most of my “free” time trying to plan out the next week (or eight). I hate the feeling of being behind and am constantly trying new strategies to get more efficient and productive, both at work and at home. I love sharing all the tricks that have worked for us as parents. My blog, The Mamma's List, focuses on those parenting tips and product recommendations that make life easier in the early days. We also talk about ways to be more productive because I'm all about efficiency. My goal is to save you time and energy so you can spend more time doing what you love, with who you love. If I can help you spend less time worrying or researching, I've done my job. Thanks for reading! Hi, I think you have no ideas how many moms you help by this informative article. This is super helpful for the working mom who has a baby and needs to breastfeed them. One of my cousins recently became a new mom. I am going to pass this suggestion to her hope so she will be benefited from here. Thanks for your helpful article with lots of information. Rosetta – so glad you found it helpful! I hope your cousin finds it helpful as well. It’s so hard being a new mom. As someone who has gone through it, I want to do anything I can to make it easier on others going through the transition! All great tips! I blocked pumping time in my outlook calendar so no on could schedule over it and I wouldn’t miss a session. It was a big help to keep my pumping and feeding routine on track, even on the busiest of days. One other tip I have to help build a freezer stash is even when baby sleeps for longer stretches during the night, get up and pump anyway. Its tough [missing sleep] but that saved me because I was having issues feeling like I had enough supply for my goals. Erin – I totally agree! I was up every night the entire first year, so I didn’t set an additional alarm to pump again during night feedings, but anything extra you can do takes off so much stress during your daytime pumps!